October | 2016 | What's Our Point? Recently, I spoke to a class of college seniors about how they should approach getting their first “real” job. For some reason there’s not a college or university in our country that teaches this. So the level of attention and engagement is unusually high, especially among students paying for their own education. My presentation includes tips on resume writing, interview preparation and techniques, how to use LinkedIn/Social Media and anything else the students want to talk about. 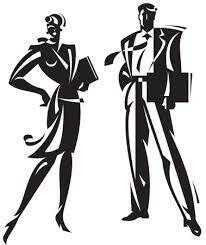 In the most recent discussion the topic that seemed to get the most attention was, “What to Wear for an Interview”. My advice is always the same: wear big boy and big girl clothes. Just because you’re interviewing for a position at an ad agency where people come to work in jeans and tee shirts, that’s not how to dress for the interview. I explained dressing well doesn’t necessarily mean dressing like one is interviewing for a job on Wall Street. Have some style. Andre Agassi said it best. “Image is Everything”. So, I’m curious. For any of you agency types who might read this, I’d like to hear your opinion. Also, mention what YOU wore the last time you interviewed. John T. Molloy’s book, Dress For Success, (1975) popularized the concept of “power dressing”. How does one dress for success in 2016?